– About Nagisa, Dango Daikazoku (now available in colours) and Sunohara’s black hair. – No love for Fuko, Kotomi, Ryou (and Botan too if you are a fan of cute animls making funny sound). A pity my favourite CLANNAD girl Fuko wasn’t in the movie. Kotomi was seen in two scenes which last a few seconds with no dialogue. – Voiced by the same seiyuu from the anime except for Okazaki. – As visually appealing as the anime. Maybe it’s just me but I prefer KyoAni’s character designs as compared to Toei Animation’s. Kyou looks kinda weird in the movie. – As humorous as the anime. Although Sunohara and Nagisa’s dad are here to provide the comic relief, it doesn’t make me laugh as heartily as in the anime (especially Fuko’s arc). – Too bad. That is assuming if you are a fan of Nagisa, you will probably enjoy the movie more than I did. Conclusion: I felt that the movie isn’t as captivating as the anime (The Fuko and Kotomi’s arc really moved me to tears). Well I guess I will probably enjoy the movie more if I haven’t watched the anime first since after all the movie was released (on Sep 07) before the anime (Oct 07). I was also kinda surprised that the fan subs wasn’t by SS & Eclipse or Sprocket & The Waffle House who did the anime but by Eien-no Anime. Was also amazed that they managed to release it in such a short time as well. The DVD was released on 7th March. Eien-no Anime released the subs on 11th March. Great job, they truly deserve a pat on the back. This entry was posted in Anime, Movies. Bookmark the permalink. I see… I heard that the movie was centered on Nagisa and Tomoya, but I would never have guessed that the others would been taken off the picture in such a drastic way. I hope to watch it soon. Guess Tomoyo is not there either. CLANNAD is certainly my favorite romance-themed anime, so it will be a must-watch for me, no matter what. d_blade thanks for coming, u are always welcomed. anyway tomoyo is in the movie as a minor character. I am not in the least interested in Clannad, but I am very much so in Dango Daikazoku. What do you mean, available in colors lol. By the way yes I have the lyrics to Dango Daikazoku, at least the link to them, in my blog. Such a nice song. panther, when Nagisa drew the recruitment poster for her drama club, in the anime it was black and white but in the movie, she drew it with crayons thus the colours. Just watched it… It was awesome. I did not expect it to be like this (especially the atmosphere), but I loved it anyway. Thanks again for showing this to me! I was surprised at the speed too… and it seems to still be in great quality. i agree on the comments you made about the movie. its hard to appreciate the movie if you watch the series first. 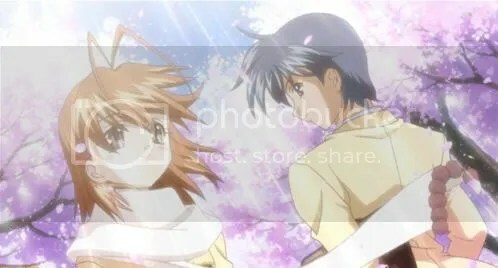 it is hard to make a movie of clannad (which only last for an hour and a half)that can match the goodness of the series. it may not be as good as the series but its still worth watching.